It's Teacher Appreciation Week, May 3-7. Let the special teacher/teachers in your children's lives know how much you appreciate the love and time they invest in your children. Yes, this includes you, my fellow homeschooling moms! You count! Here's the festivities that I--er, I mean, we--have planned. For me. For today. Since we homeschool, I am our children's teacher and The.Awesomest.Teacher EV-ER! The kiddies have been sent outside to collect flowers for me, The Teacher's Floral Bouquet special. Cost: priceless, of course. After said flowers are collected, they must assemble the assorted mix in a manner that is grouped according to the color wheel, and then by size congruence. Bingo. Just crossed art and spatial relationships off the list for today. Yes! After flowers are artfully arranged and displayed, an accompanying card of heartfelt worship--um, of thanks--must be lettered, addressed, and delivered with a kiss to teacher. Yes! Check penmanship, check language arts. This day is flying by. Weather is gratefully cooperating (Thank you, God) so recess shall be extended today (translation: teacher gets an extra half hour of coffee and emails). I hear no complaints. "Children, O Children: my life begins and ends with you. As I've confessed many a time before to you, I've always been mediocre at everything. But, at being your mother and teacher? Well, in that, I have excelled. Thank you for the privilege of having me be the one to teach you to read, the one to teach you the love of history, the one who brought the bible to life in your heart, the one..."
"Whaa?? 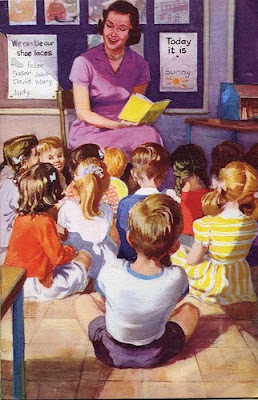 Hey, mom, I thought you said you taught us to read so that when you're dead we'll burst into tears at the sight of a book cuz --waaaah--we'll be all like, "sob sob....'tis my dear mother that taught me to read.."
HAPPY TEACHER APPRECIATION WEEK TO ALL THE TEACHERS OUT THERE! And, oh children of mine, remember, with this morning's breakfast, I like my toast just slightly crunchy, and buttered to the ends. Thank you for the gift of teaching you, getting to know you, and forever being the one who drifts in the background as you silently read to yourself. It's been a blast. It's sad I don't hear of this celebration here in my country..I don't know why. Or I guess, I'm just oblivious. I read to my son a lot. And I see his eyes sparkle every time. I never fail to believe that everytime I read to him, he definitely learns something. He's less than 2yo. Btw, thank you for leaving some lovely comment on my mother's day post. Happy Mom's Day to you in advance! way fun post! love the picture. love all of it. Wow, very cool. Teacher appreciation day sounds a lot like Mother's Day. Teacher Appreciation Day here as well. I have a desk full of flowers. First time I have ever gotten flowers in my life and I am wondering what I should do with them all. Maybe give them to my wife? Hey, you make that homeschooling thing sound pretty attractive! If you let them post a picture of the Teacher's Floral Bouquet, would it count for extra credit? I used to teach in a classroom and now I send my children to classrooms. I want them to bilingual, something I definitely can't teach them. But oh there have been many days where I have daydreamed about not having to rush to school and instead have my kidlets learn around my IKEA table, looking lovingly into my eyes. That's how it works right? So many choices one has to make as a mother. No one tells you how hard it is. I could never homeschool, I lack the imagination, dedication and enthusiasm. So hats off to those who can! There is good news and bad news for Teacher's Appreciation Week. The bad news is, all my former teachers are dead. The good news is, Good! I didn't like them anyway. and you have home ec covered so bravo! that's the most important class there is! I think you are amazing for homeschooling your kids. I'm going back and forth with the idea, my daughter has another year of pre school, then I have to decide. I don't know though. I do think that anyone who homeschools their children should be awarded number one mom DAILY for the rest of their lives. Truly a selfless thing to do. By the way, I'm new here, also a new follower :) Great to meet you! I applaud you for being able to homeschool and actually enjoy it. I could not do it. What kind of nut would homeschool?? Aren't you worried they'll never grow up? They'll never launch?? All questions that I've been asked before. I hereby send you a virtual bouquet for Teacher Appreciation Week. LOL, I love your cheeky perspective! Good for you for homeschooling! Happy Teacher Appreciation Day!!! I loved your post...too funny! ps...if you ever need any materials,etc, let me know. I would be happy to share anything I have with you. The school district where I used to teach had a teacher perceiver test for possible new hires. One of the questions was something like, "Is it important that your students like you?" Some candidates are tempted to say something like, "It's more important that they respect me," which was the wrong answer because students learn more from teachers they like. My point: just think of how much they learn from a teacher who loves them more than anything else in the world and whom they love in return! You totally rock, my friend! I'm doing the little hands down bowing out of the room thing. Wow. Its nice that you homeschool and like it. Enjoy the Appreciation week. You deserve it! It is refreshing to visit you. hi Alexandra! I realized my comment yesterday never came through, but wanted to make sure you knew I was wishing you Happy Teacher Appreciation Week!! You sound like such a wonderful, dedicated and loving mom and teacher, and I admire you for all that you do! And how clever are you to sneak some academics into your well-deserved gifts while putting a smile on everyone's faces. I hope you got your toast buttered just the way you want it! Hilarious! This reminds me of a stunt I pulled on year as a public school teacher. We were studying Sinners in the Hands of an Angry God, and I assigned an artistic interpretation of one of the three metaphors from that sermon. I told them, think bigger than just a poster. Make a shirt. Make a sculpture. Heck, make a cake and decorate it like one of the metaphors and we can eat the cake. Then I made the project due on my birthday. Heh heh heh. I didn't anticipate 20% of the students making cakes! We had 30 cakes in my class that day. True story. Oh, I love your take on Teacher Appreciation Day! I am usually guilty of forgetting about it, leaving me to scramble to find a bouquet of flowers for my kids' teachers at the very last minute. This year, I work at their school, so I was prepared for once! Thank you so much to all well wishers. The Teacher Appreciation Toast I received was an overbuttered, underdone ball of bread rolled in orange marmalade. In other words, just right. Teacher appreciation day and mother's day all in one week? Sweet! Sounds like you've got this teaching stuff down...happy Teacher Appreciation Week to you! You are a way better mom than me. I'd be in jail if I homeschooled, I really would, I would kill them. Happy Teachers Week to a better woman than I, with a great first name and a great blog's name. I teach high school, and we actually had the nicest Teacher Appreciation Luncheon this week, brought in by parents. Yum! Kudos to ALL teachers this week! !